Magnet advertising and guerilla marketing may seem like chalk and cheese due to obvious reasons. Before discussing about attempting guerilla marketing using one of the larger sizes of personalized magnets 8 x10.5, let us try to understand the basics of the term. Guerilla marketing is a term used for unconventional marketing through low cost means. It is largely inspired by the Guerilla warfare popularized by iconic Che Guerra in 1960’s. This small and unconventional marketing strategy largely depends on high imagination and it generates great brand impact. Most guerilla campaigns strike people at a personal level. That is the main aim of guerilla marketing. You have to catch your customers by surprise. Perhaps everyone else is marketing through discounts and various other saving programs, but you should do it differently with lots of imagination. Perhaps they are already expecting you to offer them some discounts and savings as others, but you should give them what they aren’t expecting – may be a scary feeling or a surprised feeling. For example – In 2007, Turner Broadcasting promoted their new cartoon show Aqua Teen Hunger by creating a faux bomb scare around the city. They placed a battery powered LED placards resembling “Mooninite” character of the show. These placards were lit during the night and they resembled bomb devices, which triggered fear within the residents. This campaign burdened Turner Broadcasting and Interference, Inc by $2 million. The scary publicity contributed to the success of the campaign. You can use 8×10.5 magnets for creating some element of surprise or scare. People would love to retain it and discuss it regularly for most part of their life. You can easily see your branding efforts skyrocketing and achieving new means. 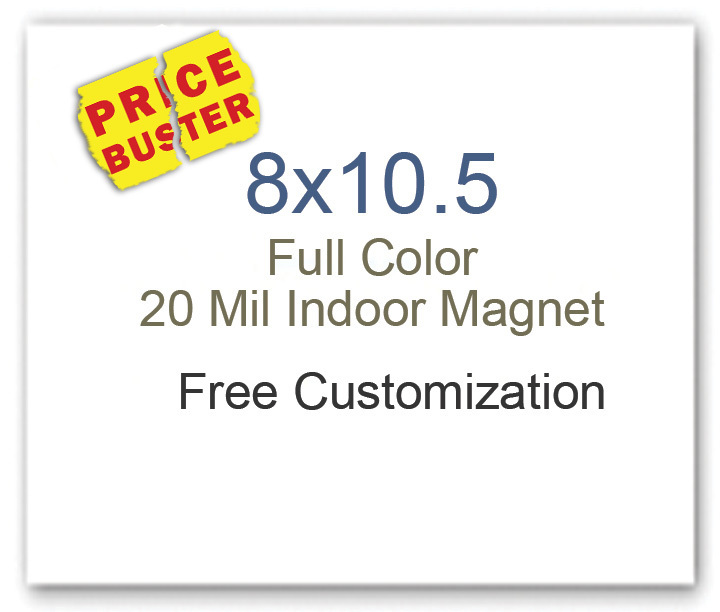 Employ 8×10.5 customized magnets to offer them an amazing experience of a lifetime. You can create a magnet advertising campaign, which may not directly deliver any amazing experiences, but may solicit its combination of other traditional strategies. For example – On February 14, 2o11, Coco Cola installed a special vending machine titled “Happiness Machine” in various shopping malls around Istanbul. The special machine was operated remotely and it dispensed free coke cans, foods, and toys to couples who proved that they were in love by cuddling and kissing before it. This campaign not only helped to strengthen brand positioning of Coco Cola amongst youth, but also earned their “lovemark”. Guerilla marketing is never a single point affair. You should try to connect magnet advertising with various elements such as technology, surprise, cell phones, pagers, etc. Create a network of surprises by connecting different elements. For example – You can trigger a campaign with statement “Give us 5 minutes of life and see the wonder awaiting you.” People should be encouraged to reach to you by various means and purchase from you. This type of marketing will easily bring you undivided traffic and encourage them to create a stir about your brand. You can attempt Guerilla marketing in many other ways to excel. Remember the method, which have worked for Coke and Turner Broadcasting may never work for you. So, try to indulge your emotions and creativity to find what may work for you. And of course, these 8×10.5 magnets are always there for you!